Description: Annual herb covered in long white appressed hairs. Stems simple or sparingly branched, 30–100 cm high. Leaves linear-lanceolate, 50–100 mm long. Peduncles 30–90 mm long. Calyx 30–50 mm long. Petals red, shorter than the calyx, erect appendages absent. Capsule obovoid, sometimes rather campanulate, longer than the calyx tube. 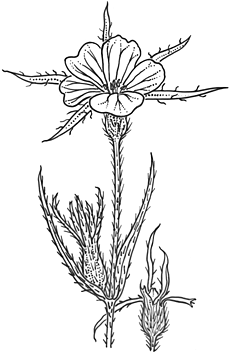 Distribution and occurrence: An occasional weed of cereal crops; doubtfully naturalized in N.S.W., no recent records. Native of Medit. Other Australian states: *Tas. *S.A.